While the end of the year is often associated with the holiday season and gathering with family and friends, for many gardeners, it’s the start of their next great garden – thanks to the arrival of seed catalogs. Surrounded by a plethora of newly arrived seed catalogs, it can feel overwhelming yet exhilarating. So how does one go about navigating the sea of seed choices? Each catalog seems to have discovered their own secret formula to draw you in with their seductive covers and enticing descriptions. 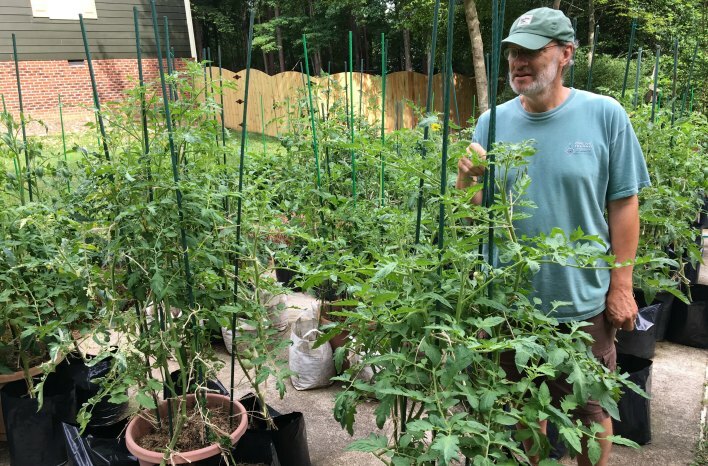 Epic tomato grower Craig LeHoullier starts all his plants from seed. In fact, he buys and saves thousands of seeds each year. In this podcast episode, we’re chatting with Craig LeHoullier. 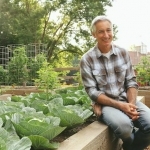 As an advisor to Seed Savers Exchange, author, and plant breeder, Craig knows his way around the seed catalogs and the companies that sell them. 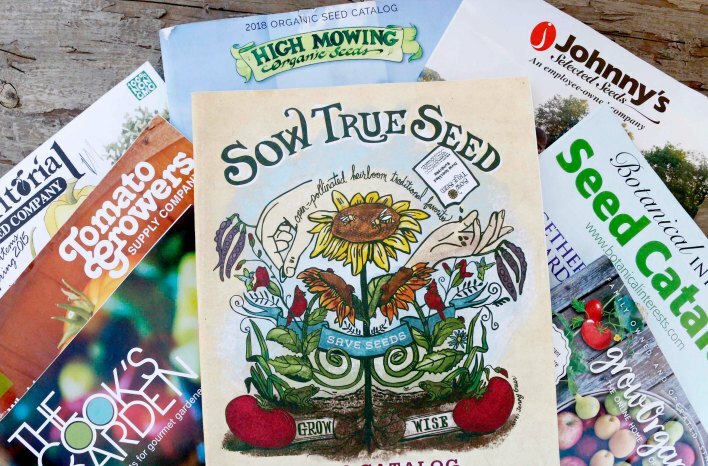 With so many choices and so little time, we’re offering up some practical tips and advice on savvy seed catalog shopping. It is easy to get overwhelmed with the stacks of catalogs hitting your mailbox all at the same time. While some companies offer just about everything under the sun, many companies specialize in a much smaller niche. To help narrow the field consider the following tips for where to place your seed orders. Make a Plan. Having a plan before you start perusing the pages of seed catalogs is the best thing you can do to prevent overbuying, impulse purchases, and sourcing the best companies for what you need. Not having a plan ahead of time is like doing your grocery shopping on an empty stomach. Not good! Know your Limitations. Take stock of previous seasons. What worked well, what didn’t, and where can you make simple changes. There’s no point in buying seeds of plants that simply don’t grow well in the conditions you have, no matter what the description says. 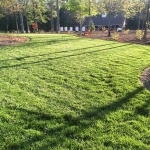 Do you have a short growing season? Are there constraints on how much room you have to grow? There’s no point in spending too much time with catalogs for plants that require conditions you can’t offer. What Type of Gardener are You? If you’re into rare and exotic plants, maybe the general catalog is not where you start. Perhaps your passion is vegetable gardening with not a lot of interest in flower gardening. Or you may insist on only buying certified organic seeds. 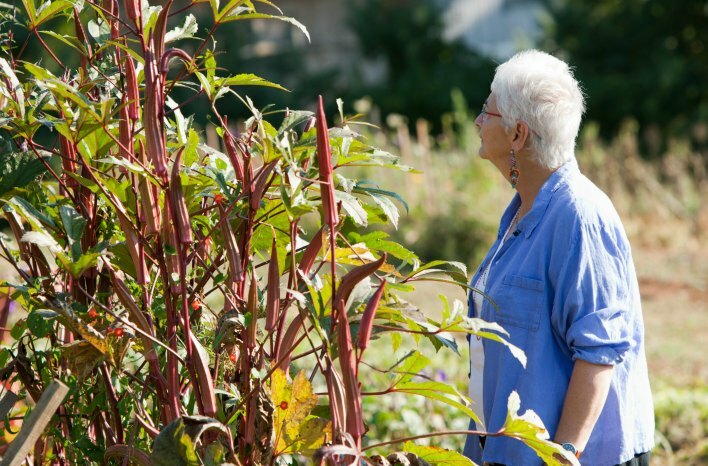 Being realistic about who you are as a gardener will quickly help narrow the field. Do you only need small quantities? Some companies specialize in offering smaller quantities. It’s a good way to save money without having to buy more than you need. Check Company Reputation. If you want to learn more about a company’s reputation, you can visit online services such as Garden Watchdog. Or call the company and talk to the customer service department. Ask fellow gardeners who they like. Word of mouth from trusted sources is one of the best ways to get sound advice on the best seed-buying sources. Does Company Size Matter? Large companies can be a one-stop shop for all your seed-buying needs while providing a great product and excellent service. Alternatively, you may find that a smaller, regional company suits you better. There’s a lot to be said for that. Regionally grown seed sources may perform better in your garden. Personally, I enjoy supporting companies owned and operated by a small team of dedicated gardeners who are doing what they do for all the right reasons. It may take some time to establish your list of favorites. My advice is to try several companies. There are many great choices. While it’s human nature to stay in our comfort zone and stick with what we know and like, that can be quite limiting with all the wonderful options for seed varieties today. I confess to being one who tends to stick to what I know and like. Yet that is such a missed opportunity for great adventure and new discoveries. Here is my suggestion for the best of all worlds. Tried and True: There’s nothing wrong with sticking with what you know and like. There’s a lot to be said for keeping with a winning track record. But don’t stop there. Something New: The best way to become a better gardener is always to experiment. And that certainly includes growing new plants. While you don’t have to make drastic changes in your plant preferences, there are just too many varieties available to not venture out even a little. There’s no harm in trying new things. Something Fun: This is where you should let your hair down and go for something you’ve never tried before, not even remotely. Perhaps it’s an unusual or exotic winter squash. Maybe it’s a new cut flower variety or new-to-you native perennials. I guarantee that you will find a new excitement simply by growing something a little out of the ordinary. Mix it Up: Even if your interest in seed starting and gardening is limited to vegetables, herbs, or flowers, grow some of each. Diversity is the key to a healthy, thriving garden. 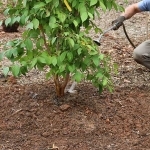 It’s also the key to attracting a wide array of beneficial insects and pollinators. Your garden will thank you for it. Keep a Running List: It’s very dangerous to your pocketbook when you go seed shopping without a plan. A running list that you’ve worked on and thought about through the year is a sound way to buy what you like and need, without getting too far off course. Maybe you Don’t need to Buy New Seeds: Ask yourself how many seed packets you have laying around your house right now that might still be viable. It’s likely a lot more than you think. For example, even at room temperature, tomato seeds can last over 12 years. Refrigerate or freeze them, and they will last much longer still. Craig LeHoullier has saved thousands of seeds over the years. Even stored at room temperature like these, tomato seeds will last 12 years or more. 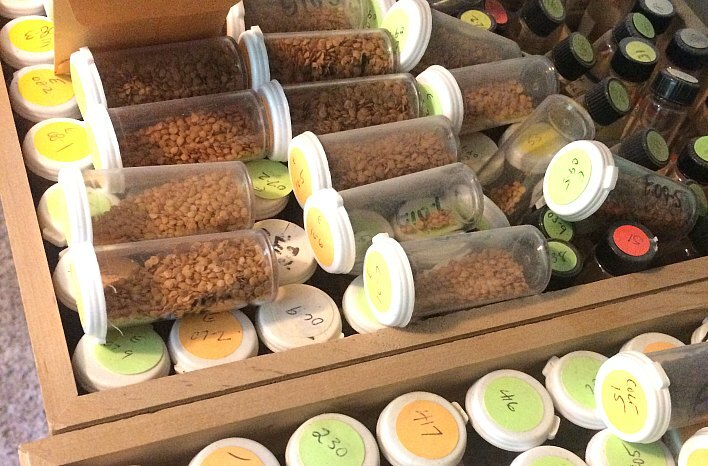 Don’t Order More Than You Need: If you do find that you have many unopen seed packs from your over-ambitious orders past, this may be reason enough to tighten up on your next order. You’re not alone if you’ve accumulated enough seeds to start your own catalog company. But it’s a good indication you should dial it down this time. Do Order More Than you Need: On the other hand, you can easily argue that buying extra seeds is not a bad thing. In fact, most surplus seeds can and should be planted even years later with good germination results. Yet the reason to justify buying seed quantities beyond your immediate needs may be to take advantage of bulk pricing. And you can easily get a group of friends to split the order, including shipping cost (which can often be a big part of the order). If you’re looking for a fun way to fund your seed buying habit with all those extras, consider growing them out in small containers and offering them for sale. You will be pleasantly surprised by just how many people buy your plants. And these days, with so many easy ways to get the word out, you should have no problem finding customers. Comparison Shop: You might be surprised to know that seed prices for the same varieties and quantities can vary greatly from one company to the next. Or, it may be that prices are similar, but shipping costs are much different. Either way, it pays to compare prices and charges before you make that order. And be sure to check for online coupon codes. Be Realistic: Even with the best of intentions, your optimism for the past growing season got the best of you. It happens. So, if you hear that little voice inside your head questioning your enthusiasm, take heed. While the worst-case scenario is not a bad thing, this is your chance to catch yourself while you still have time. 005-What’s Wrong With My Tomato?